Who will win? 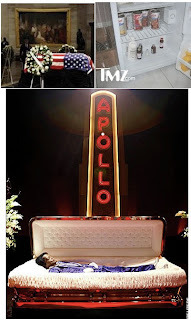 Which family can keep the corpse of a famous person above ground longest? Right now James Brown’s people are in the lead- but Anna Nicole Smith’s handlers are making a miracle run! 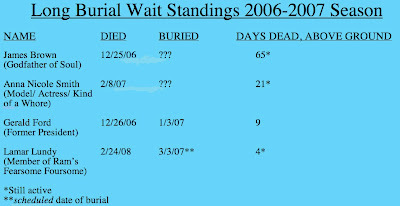 Clearly James Brown (hardest working corpse) has what one would think is an insurmountable lead, but with Anna Nicole’s mom and that wacky judge and the fact that the whole court case is taking place in Florida, you never know. My money is on JB, but if Lohan kicks it “will-less” this Spring, all bets are off! How about King Tut --the Egyptians kept him around for 5,000 years --i would love future generations to be able to see James Brown - dude. It probably would be like us looking at an ancient ape man. "Mommy -what's a black singer and vulgar dancer?" --" Button up your ozone suit Timmy and i'll explain it to you"
Mrs. Bandit is on fire!